Another New Update from Ecomdash… an Etsy Integration! Online retailers who sell on Etsy love the creative and growing marketplace-community, 30 million strong and counting! Ecomdash is growing right along with Etsy and we are excited to announce we are now integrated with the popular marketplace. Ecomdash and Etsy share many of the same customers; small businesses, creative entrepreneurs and hobbyists. We also share a common mission, to help sellers start and grow their business. Sync Inventory: As your products are sold on Etsy and any other marketplace or storefront, ecomdash automatically updates Etsy inventory levels and syncs the balance across all of your sales channels. Consolidate and Import Sales Orders: Import your sales orders from Etsy and other channels as often as every 5 minutes. No more manually checking for sales orders in every channel you sell, ecomdash does the work for you and displays what you need to know in a central dashboard. Fulfillment and Shipping: Ecomdash consolidates products across sales channels including Etsy, allowing you to easily prepare your products for shipping. You can create custom packing slips and shipping labels. Once products are shipped, ecomdash marks the item as shipped in the marketplace and sends a tracking number to your customer. Products: With our product listing software, you can manage your product attributes and price, without logging in to Etsy. Make updates in batches and submit changes within your ecomdash account. We’re especially thrilled for our current customers and other sellers who have considered adding Etsy into the mix. This new Etsy integration makes it easier than ever for those selling on Amazon or eBay to add another marketplace; they can control everything from one central dashboard. That’s what we’re all about, making it easy for businesses to sell more, in more places – in less time. Check out our list of other ecommerce integrations to see who else we partner with. How will my inventory sync across Ebay and Etsy if I am identifying an item on Ebay with a SKU and the same item on Etsy with a Listing ID number? I am having a hard time understanding how Ecomdash will know that the inventory of SKU 12345 and the inventory of listing number 00354857 are the same item and how they will sync so that I show only one inventory quantity for both sales channels. Do I have to manually align these two numbers? I currently have 500 of the same items listed on each sales channel. The main reason I want to use Ecomdash is to prevent splitting my inventory between the two sales channels, which I am currently having to do. 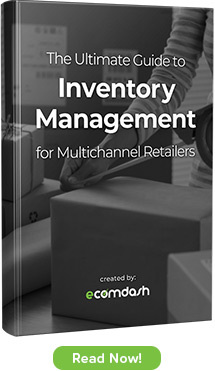 In some cases I am selling out of an item on one sales channel and have plenty of inventory on the other sales channel – which means having to move some inventory by adjusting the inventory levels on both sites. Great question, thanks for reaching out with it. Ecomdash has a unique mapping ID system that can recognize your eBay SKU and Esty listing ID as the same product. When that item sells on eBay, ecomdash will identify the sales order and update the product quantity of that item on Etsy. This transpires automatically – you will not have to manually check for these orders. You can download your listings from either sales channel into ecomdash quickly. Hope this helps. If you have more questions or would like a free 30 minute consult of how ecomdash works, I’d be happy to forward your question along to our support team. Have a great day, Wayne! How can the system update a product quantity if my etsy.com listing has size variations but does not allow for a SKU? Our Unique Mapping System allows us to recognize your Etsy listings and consolidate them with your other marketplace or website listings for that same product. Ecomdash is able to track items on the SKU-less Etsy marketplace and connect them to any other sales channel where you have that item listed. Our support team will be able to explain this in greater depth and walk you through it (I’m in marketing and not as technically gifted as they are!). Would you like me to connect you with a support team member? I am looking to integrate and consolidate multiple online platforms such as my website, etsy,ebay,bonanza & shopify. I want to have my listings simultaneously uploaded and my sales and conversations available to manage on one platform. I would also like my inventory interconnected so I don’t oversell custom items. It sounds like ecomdash is a great solution for you. You can easily manage your listings, sales orders, and shipping methods across multiple sales channels from one place. We currently support Etsy, eBay and Shopify. We are not currently integrated with bonanza, but we have an open API that you could use to integrate bonanza with ecomdash. If you would like more information about the services we offer, please feel free to contact our team. Thank you for your interest and happy selling!